2013 was the breakout year for Diana Mayonde Nduba, after she gradually released a bunch of well received tracks via SoundCloud in addition to being one of the standout features in Just A Band’s 2012 Boxing Day Special compilation. Her soulful-electric-chill musical style, stellar vocal presence and beautiful song-writing earned her thousands of instant fans, culminating in her debut performance at one of East Africa’s most popular performance venues, Blankets & Wine. Perhaps it was wedding Just A Band’s Mbithi Masya or finally being ready to concentrate on a debut album that motivated the change of her musical brand name from Diana Nduba to simply Mayonde, but the re-brand has not altered her awesomeness one bit. Isikuti Love is her second single as Mayonde, preceded by Rise, a tribute to Maya Angelou. Isikuti Love explores the musicality of love and how it can be viewed as a never ending soundtrack to our lives – with its highs and lows, climaxes and choruses. Mayonde compares being in love with the relationship between a drummer and his drum and how both are essential elements to making those vibrations that we call music. The track also explores the close relationship between dance and romance. Meeting up and falling in love at a dance or musical gathering has been an African thing since time immemorial. The ability of music to bring individuals and communities closer together and strengthening their bonds is something that has been universally understood on a human level. If there is any song that summarises this fact well then it must be Isikuti Love. Also noteworthy is how Mayonde does this from an African context throughout the ages from the pre-colonial (isikuti, nyatiti, wandindi references), colonial (homage to Miriam Makeba’s Pata Pata) and modern times. That is how deeply layered this track is in all of its apparent simplicity. Mayonde’s vocal presence shines through once again and is further enhanced by equally sublime backing vocals from Jim Chuchu (as Adeiyu?) who must also had a role in producing the chilled yet vibrant, throwback feel of the track. 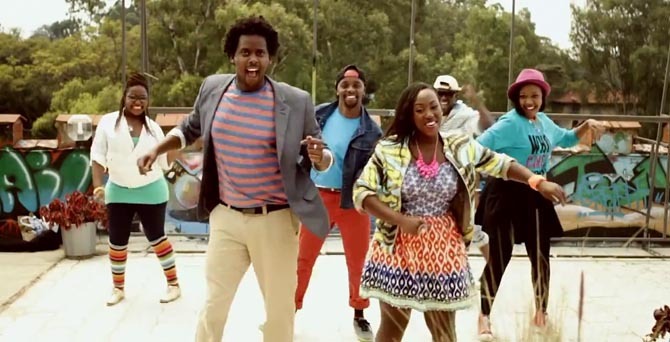 The video is also a colourful and lively affair that sticks to the theme of dance and romance. Shot on location at Pawa254, it’s all about busting a move or two like you always should on a sunny happy weekend. The choreography is great and just enough to convince us that these guys are having one heck of a time. This is one of the best tracks out this year, once again confirming that Mayonde’s debut album will be nothing short of epic.